Sheridan, located in north-central Wyoming 23 miles south of the Montana border, is steeped in western history. 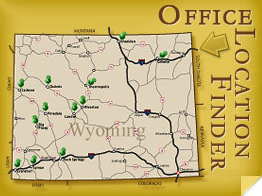 We are at the foothills of the Bighorn Mountains and wide open spaces. We are home to the Trail End State Historic Site, Bradford Brinton Memorial, Fort Phil Kearney, the Antelope Butte Ski Area and numerous other attractions. Sheridan, where the Old West meets the New West!